There are a number of different emergency events that people prepare for; unfortunately, far too many people ignore the most likely ones and focus on things that may or may not ever happen. But there are some events that are actually pretty predictable. At some point, everyone is going to have to deal with a natural disaster, so preparing for these events is something that we all need to take seriously. While every disaster will have its own set of unique challenges, there are some things that you can expect during most natural disasters. Whether it’s a hurricane, flood, earthquake, wildfire, or even just extreme seasonal storms, there are a number of things you should be prepared to deal with. Expect to be without utilities for several days to several weeks. That means services like electricity, gas, and water could be affected. Disruptions in Food Distribution. Depending on the severity of the disaster, it’s very likely that you will see at least temporary disruptions in food delivery systems. Your local grocery stores may have trouble keeping food on the shelves. Loss of Infrastructure Services. Things like trash collection, emergency services, and even hospital services could be affected. Crime, Looting, and Violence. During most disasters, there is usually a pretty big uptick in the amount of crime. From unprepared people who are desperate to find supplies, to the lowlifes who prey on the innocent in the aftermath of a disaster, this is something that has become far too common of an occurrence post-disaster. Do you know what Disasters are most likely in your Area? In order to plan for emergencies, you need to know what disasters are most likely to affect your immediate area. Do you live in an earthquake zone? What disasters have affected your geographical location in the past? If you live in an area that is prone to a certain type of natural disaster, then that’s where you need to start your planning. I suggest performing a survival threat assessment to find out what disasters you should be preparing for. Do you have an evacuation plan in Place? Being prepared for natural disasters means preparing for the possibility of having to evacuate your home, and possibly even your city or state. Events like hurricanes, wildfires, and earthquakes can create a situation where hunkering down could prove to be a life-threatening decision. It’s essential that you have a plan in place to deal with evacuation causing disasters. Depending on where you live, millions of people could be hitting the roads trying to flee the area. If you don’t have a plan, or you decide to wait for the government to issue an evacuation notice before you leave, you’re probably not going to get out of town on time. At the very least, you will find yourself stuck for hours in traffic with hordes of people all trying to escape; but more likely, you will probably find yourself stuck in the danger zone without a way of getting out. Your plan should have a trigger. You need to decide ahead of time what things would need to happen for you to kick your plan into place. You need to keep communication in mind and have a plan for contacting your loved ones during an emergency. 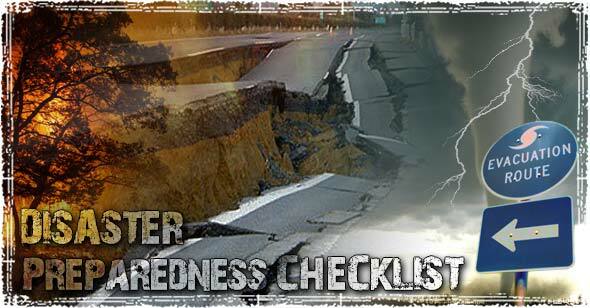 You need to Practice your plan before disaster strikes. For more information on evacuation plans and Bugging out, check out our Bugout Resource Guide. Is your Home Disaster Ready? When disaster strikes, there is a good chance your home is going to sustain some sort of damage. To minimize the effects of the disaster, and to help ensure your safety, there are some things you should be aware of. Find out where your homes emergency shutoffs are located. If a disaster ruptures your water lines or gas pipes or causes damage to the power grid in any way, you may need to shut off these utility services at the source. Do you have a Safe Room? You should have a room in your home that is a dedicated safe zone – an area away from windows that have been structurally fortified to withstand severe weather. Is your emergency gear easily accessible? Things like flashlights, candles, and emergency radios should be in a place where you can easily grab them once trouble strikes. Is your home attack proof? During times of crisis, criminals usually try to take advantage of the situation. You need to be prepared for the possibility of looters and people who are seeking to do you harm. If you don’t have a firearm, you need to consider purchasing one and learning how to use it. You need to make sure your home is fortified to withstand an attack or home invasion. You need to have a plan in place, and everyone in your family should know what to do should a criminal try to enter your home. Do you have an emergency kit, and will it last at least two weeks? Most preparedness experts recommend having 72 hours’ worth of emergency supplies; that number is completely wrong. At minimum, you need to have a two-week supply of food, water, medicine, and emergency supplies on hand at all times. When stockpiling water you should store 1 gallon per day, per person in the household. You should also know where all the water sources are around your home. Food supplies for a natural disaster are a little different than those for a long-term disaster, as you want to make sure you have plenty of easy to prepare foods that don’t require a lot of cooking. Make sure you have a fully stocked first-aid kit, and if you have medical problems make sure you have extra medication. Check out our article on how to prepare if you have health problems. Do you have cash on hand? Even during small-scale disasters, power outages can affect electronic payment systems — making your debit and credit cards completely useless. You should always have some emergency cash on hand. Should you need last minute supplies, or need to rent a hotel room during a temporary evacuation, having cash could become extremely important. Do you have a way to generate power? Most natural disasters can have a destructive effect on the power grid. From temporary power outages to outages that can last for weeks, or even months as we seen after Hurricane Sandy, you need to be prepared to deal with shutdowns in the grid. How to Choose the Right Emergency Generator for Your Home: Our Generator worksheet will help you determine the right size generator for your situation. The Top Portable Solar Panel Chargers for Disasters: Advances in solar technology have made it possible for everyone to have a small emergency solar backup. These small portable devices can help keep things like cell phones, small tablets, flashlights, emergency radios, ham radios, and GPS devices up and running. Make sure you have a way to cook food. I recommend having some sort of outdoor stove or grill so that you can still cook should your power and gas go out. Are you Psychologically prepared to deal with emergency situations? Throughout history, people have endured many unthinkable hardships. From the arctic explorers who survived being shipwrecked for years in the brutal conditions of the Antarctic, to those who survived the unthinkable conditions in Nazi Germany, the one thing these survivors all had in common was the will to survive. To truly be prepared to survive any type of disaster, you need to cultivate a mindset that goes far beyond just having the skills and gear to survive. Surviving Traumatic Events starts with developing the Right Mindset: The will to survive is probably the single most important aspect of surviving a traumatic event. Disaster Related PTSD: How to Recover from Disasters and Traumatic Events: Disasters can have severe mental and physical health consequences, developing the proper coping skills and strategies can help get you through even the toughest situations. Prepping without giving into Fear: While aspects of fear can be helpful during certain situations, if you don’t learn how to how to properly control it, it can be a debilitating killer. Are your family, friends, and children prepared? During your planning, it’s important to realize you’re not an island. If you have loved ones who live in your home, or people you take care of on a regular basis, these people need to be on board with your plans. An emergency is not the time to start teaching them what they should or shouldn’t do. How to get your family to start prepping for disasters. How to make sure your children are ready for emergency situations. Preparing your Child for Disasters that happen at school. Once you have your plans in place, you need to remember to practice and periodically review your procedures to make sure nothing has changed. Conduct drills; ask your family members if they remember where to meet and what to do, make sure your emergency supplies are up-to-date, and stay on top of anything that might require you to rethink or rework your plans. Good ideas/perspective!! I made a new list . . Thanks!!! Really found the section on mentally preparing for disasters to be incredibly useful and something that you neve really hear people talk about. I’ve had a bit of anxiety over being prepared and those articles really helped put things into perspective. Buy flameless candles. Preset them to come on throughout the night from dusk till dawn. An excellent resource to prepare for a disaster. Global Warming is making natural disasters even worse each year, especially hurricanes so we must be ready. This is the kind of disasters that makes all our efforts as preppers not being a waste of time but a very wise decision. Don’t rely on road maps to get out of town. Explore local roads NOW and learn the quickest ways out of town in several different directions. Also, explore the back roads. In an emergency, you need to know the alternate roads where there will not be heavy traffic. When an emergency arises, you don’t need to waste time scouring the maps to decide which roads to take. You need to be able to act quickly and decisively. Rapid evacuation just may save both you and your loved ones lives. Also, download and become familiar with the WAYZ Phone App. It can tell you alternate routes to take to get out of town when there are traffic backups. The most important point to me is knowing what disasters may occur in your area. There are a lot of earthquake faults through out the USA that a lot of people don’t realize. I like the bullet point presentation.